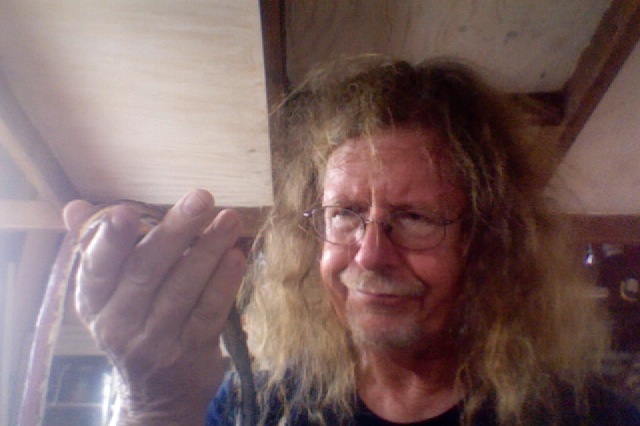 Here is a picture of a frazzled, windblown, filthy, profusely sweating Mungo looking at. . .What? Go ahead, guess. Really. We'll wait. No, it is not a mangrove worm. That, friends, is a strip of silicone caulk that I spent a good part of a steamy afternoon peeling off the front deck. We kept having leaks during rainstorms through and under the fore wall, and I kept putting more and more of this crap on the seam where the wall meets the deck, trying to catch them. That's not fair. The "crap" comment, I mean. Silicone caulks have some wonderful applications, they are absolutely waterproof, and almost nothing will stick to them. It's that latter quality that limits their applications, that lack of stickiness. Properly adhered, they will keep water out for decades. NOT properly adhered, they will actually TRAP water behind them, rotting wood, corroding metals, and, in general, making a mess of things. When I peeled this mess off, the seam between the ply and the deck was wet, and beginning to decompose. I wound up sanding the surface, cutting out some of the damaged wood, dusting the remainder with sodium borate (which I recommend for both insects and rot), running a bead of traditional vinyl based painter's caulk, and then screwing in a 1" X 1" piece of treated oak, caulking the edges of THAT, and then painting. ....did I mention the heat index was 107F? Virtually every place aboard we used silicone sealant, the material has failed and had to be replaced with other sealants, weatherstripping, or both. Hey new stuff over at Life, Art Water.